I'll be the first to admit that I struggle with patience. Like, struggle BAD with it. For those of you who have children, you can go ahead and snicker. Yep, having children has definitely put my patience (or lack thereof) through the ringer. Which is why many times you hear of the stories of B getting into something, but rarely do you get a picture. I just can't take it, and normally explode upon the sight of him into something. I'm trying to get better, and have had some great tips and encouragement through reading Dobson's "The New Strong Willed Child." I'm about a fourth of the way into it, and to me it's the best parenting book I've read so far. I think every parent should read it, even if they don't have a strong willed child. Anyway, back to my story. So today, I guess God wanted to put my newfound determination to not snap at every toddler whim into play. Brayden was being awfully quiet while I was in the living room. Probably folding clothes, since that's what I did most of today. When I yelled "Brayden, what are you doing?" across the living room he didn't respond which was a bad signal to me. 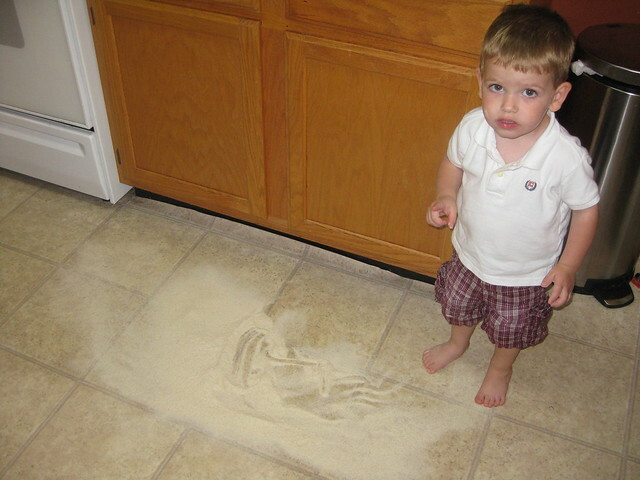 I rounded the corner of the kitchen and found this. He knew what he had done wrong. But this time I was able to hold my head above the drowning water of anger and deal with the situation coolly.